The board game of Scrabble was invented by architect Alfred Butts in the late 1930’s. Butts had previously created a word game but had had little luck selling it to any major outlets. Ten years later he sold the rights of the game to a lawyer from Connecticut, whilst keeping royalties per unit agreement should any be sold. The lawyer, one James Brunot managed to strike up a deal with huge store Macy’s in the US and within years Scrabble (as Brunot had renamed it) became a huge success. By the mid 1950’s Scrabble was also released in the UK and Australia and is now sold in over 120 countries in the world. Scrabble is a board game that involves the players (two to four of them) making words out of lettered tiles. These words are connected on the board and cover certain multiple score squares. Each letter has a point score value and these are added up in order to determine the overall winner of the game. A scrabble board is essentially a large grid made up of 15X15 squares. The letter tiles fit within these squares and can be placed across or down. There are 100 letter tiles in the game, two of which are blank and can be utilised as any letter in a similar manner to the way in which the joker can be used as a wild card in various card games. As you would expect the blank tiles carry no point score and the other tiles have point scores that are determined by the difficulty of the letter. For example an A is worth one point, whilst a Z is worth 10 (along with Q). The Scrabble tiles are placed in a pouch (usually included with the game) and mixed. Players then draw one tile each to determine who goes first, this is usually the closest alphabetically to A, or the highest point value (which ever is decided). Once this is determined the tiles are returned to the pouch and mixed once more. Each player takes seven tiles from the pouch and places them on their letter rack (again included) facing themselves and out of view of the other players. Play begins with the first player placing a word using their tiles on the board. The word can be any length, though the more tiles used, the higher the score and the more new tiles picked up to replace them. During their turn a player has various options, they may pass, thus forfeiting the turn, exchange tiles (if they have no useful letters) forfeiting their turn or play a word. Playing a word is the best option usually as this will at least add points to the players score. Scoring in Scrabble is determined by the quality of words placed on the board and where they are placed. If for example a player is lucky enough to use difficult letters in a word placed on a multiplier space, for example a triple word score, their score will be greatly improved and it is the overall score at the end of the game that determines the winner. Words in Scrabble are all interconnected in similar fashion to that of a crossword, with crossover letters used to fill gaps in the players own compliment of tiles. For example if the word Phone is played on the board and no other words interfere, the next player can use the word Nice, if they have an I, C and E tiles but no N. It is also possible to make multiple words by overlapping, thus greatly increasing their score. 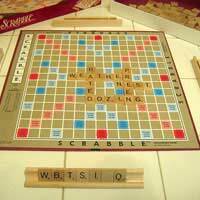 There are a few variants to Scrabble, including home rules for what words are acceptable and what words are not. Some players will for example allow acronyms and abbreviations. Others will only allow dictionary words. Some may allow movie, song and names. It is really up to the group playing what rule variations that adopt, or indeed adapt.